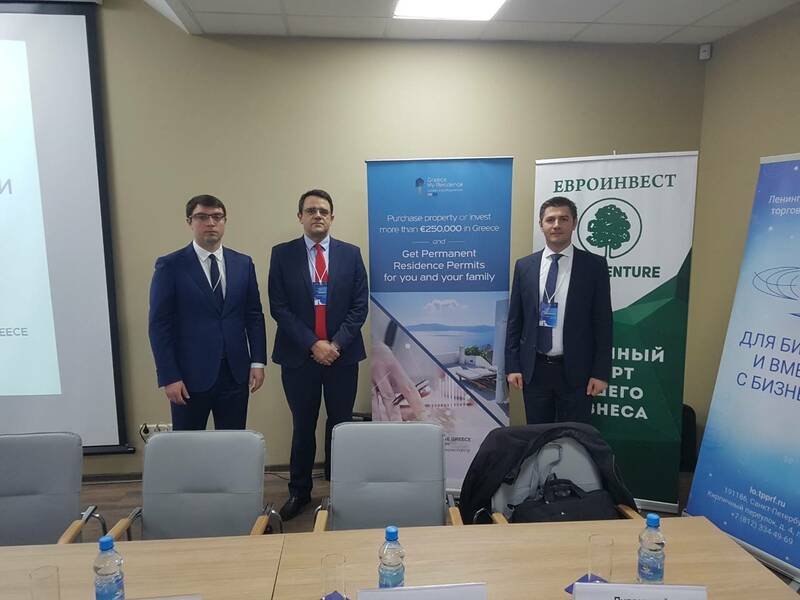 Grekodom Development took part in the forum «Investment opportunities in the tourism and real estate sectors in Greece, and the program of the Greek Golden Visa». Grekodom Development took part in the forum «Investment opportunities in the tourism and real estate sectors in Greece, and the program of the Greek Golden Visa». The forum was held on May 30-31 in Moscow and St. Petersburg (Russia). One of the main investment events in Russia was organized by the Greek company Enterprise Greece, which deals with investing in Greece at the state level. The event was organized with the support of the Greek Embassy in Moscow and the Leningrad Region Chamber of Commerce and Industry in St. Petersburg. Important issues in the field of Hellenic-Russian economic relations were discussed in the forum. Economic perspectives and investment opportunities in the Greek tourism and real estate sector were considered, and the features and advantages of the «Golden Visa» program were studied. Grekodom Development made a presentation on investment attractiveness in Greece in the areas of residential and commercial real estate. The prospects of the Greek real estate market, as well as opportunities for investors were considered. Our company found new like-minded partners in this forum. On behalf of the company’s management, Vladimir Papounidis, the vice-president of the company and Konstantinos Petridis, the general director of Grekodom Development, we would like to thank Enterprise Greece for organizing such an important event for the Hellenic-Russian relations. In addition, we would like to express our gratitude to the Greek Embassy in Moscow and the Leningrad Region Chamber of Commerce and Industry in St. Petersburg for their support in holding the investment forum. In future, we plan to develop and strengthen the obtained links for promoting the Greek market, both in terms of real estate and tourism. These spheres are inextricably linked. We hope that our joint efforts will lead to reliable cooperation between our countries.